Before discussing the applied mechanics that are useful in orthodontics, or the biomechanics of moving teeth in orthodontics, certain fundamental concepts must be presented. Without using rigorous scientific proof and physical laws or formula, explanation of certain phenomena only by using words alone is either imprecise or incorrect. International System of Units (SI) is considered as the modern form of the metric system. It is based on the meter-kilogram-second (MKS) system, rather than the centimeter-gram-second (CGS) system. where a is the acceleration vector, m is the mass, and f is the force vector. A vector has magnitude (a scalar quantity) and direction. A vector is represented by boldface whereas the magnitude is by italic. The gravity at the Moon's surface is about one-sixth as much. Some people are confused about weight and mass. Some are also confused about acceleration and gravity. They are different. where W is called weight. For a free fall of an object in air, with the presence of frictional force, its acceleration is less than the gravity. Only if it is in a vacuum, with the abscence of any frictional force, then its acceleration would be equal to gravity. It is convenient in dentistry and orthodontics to use gf as unit of force and N-cm as unit of torque, but it is inconsistent. One of the most fundamental structures in mechanics is a cantilever beam (Fig. 1). The left end is fixed --absolutely rigid, and the right end is free. The cross section of the beam is shown on the right. The beam is of length L, and its cross-sectional area is the width b times the height h.
Many health professionals know the cantilever effect, but not too many people know the formula associated with this effect. which is linearly dependent on the width b but is proportional to the height h raised to the power of 3 (cubic). Thus, the maximum deflection is proportional to the 3rd power of the length. For example, if the length is doubled, the maximum deflection is increased by 8 times. This simple yet fundamental structure is planar (in the plane of the page), and the displacement is only a function of x. It is considered as 1D (one dimensional). When the displacement is planar but a function of both x and y, the problem is 2D (two dimensional). If the displacement is a function of all three x, y, and z, the problem is 3D (three dimensional). Thus, the problem is complicated. The stiffness of the structure about the z-axis depends on the area-moment of inertia about the z-axis. Its stiffness about the y-axis depends on the area-moment of inertia about the y-axis. Similarly, its stiffness about the x-axis depends on the area-moment of inertia about the x-axis. They are all different. Although 3D is complicated, but with the advent of CBCT (cone beam computed tomography) in dentistry (in general) and in orthodontics (in particular), it is necessary, more than ever, to examine dental structures in 3D. The boundary conditions (BC's) of a structure are also one of the most important concepts in mechanics. These BC's can be expressed mathematically in terms of displacement and its derivatives (not shown). For many ideal problems, the geometry of the structure and the BC's are simple; thus, the exact solution can be obtained via analytical methods. Simple geometry and BC's lead to manageable differential equations and closed-formed solutions. The mathematical solutions of the governing differential equations depend primarily on the BC's. Many engineering students obtained incorrect solutions because they use incorrect BC's. In many real-life situations, when the structures are not ideal, obtaining the exact solution is impossible. Thus, numerical methods are used to obtain approximate solutions. Also in this case, the answers are only as good as the BC's. It is often difficult to assign proper BC's for these real-life applications. One of the most practical numerical methods is finite-element method (FEM), also called finite-element analysis (FEA). Work in the literature with FEM may show colorful images, but the solutions may be incorrect because either the structure or the BC's or both are inappropriately assumed in the model. For example, in some research, bone is stated as orthotropic (different material properties in different orthogonal directions), but the work is done with bone assumed isotropic (same in all directions). In addition, the computer simulations often show questionable results. For example, in some research, all the results are discussed with the hidden assumption that bone fails by the principal stress. But there is no proof that is true. Which one is truly responsible for bone failure? Is it due to principal stress or maximum shear stress or von-Mises stress or a different type of stress? The term torque often used in orthodontic community is incorrect or inconsitent with the term torque used in engineering mechanics or physical sciences. Thus, torque does not exist if there is no twisting! In other words, the term torque is used appropriately only if there is twisting motion. The concepts of kinematics and dynamics and the differences between the two may be confusing even to some engineers and physicists. Kinematics is the study of properties of motion (position, velocity, and acceleration) without any consideration of forces and moments. And dynamics is the study of forces and moments and their effects on motion, with a clear understanding of kinematics as prerequisite. In orthodontic usage, the term "torque" is used to indicate the moment that is used to move the tooth in the labial-lingual direction. (But the tooth could be moved as such by force or by moment or by couple or by some of these or by all of these.) If the crown is moved labially, then the "torque" is called positive. If the crown is moved lingually, then the "torque" is called negative. But there is no twisting motion here. Thus, this usage is incorrect. It is inconsistent with standard in engineering mechanics. For example, instead of saying "labial crown torque," it may be better to say "labial crown movement." Note that the term torque used with dental implants (in implantology) is correct with engineering standard. "Periodontium refers to the specialized tissues that both surround and support the teeth, maintaining them in the maxillary and mandibular bones. The word comes from the Greek terms peri-, meaning "around" and -odons, meaning "tooth." Literally taken, it means that which is "around the tooth". Periodontics is the dental specialty that relates specifically to the care and maintenance of these tissues. The periodontal fiber or periodontal ligament, commonly abbreviated as the PDL, is a group of specialized connective tissue fibers that essentially attach a tooth to the alveolar bone within which it sits. These fibers help the tooth withstand the naturally substantial compressive forces which occur during chewing and remain embedded in the bone. Functions of PDL are supportive, sensory, nutritive, homeostatic and eruptive. The tissues of the periodontium combine to form an active, dynamic group of tissues. The alveolar bone (C) is surrounded for the most part by the subepithelial connective tissue of the gingiva, which in turn is covered by the various characteristic gingival epithelia. 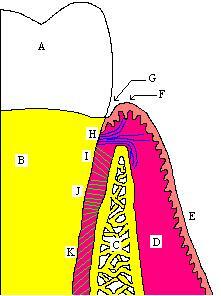 The cementum overlaying the tooth root (B) is attached to the adjacent cortical surface of the alveolar bone by the alveolar crest (I), horizontal (J) and oblique (K) fibers of the periodontal ligament. The gingival fibers, (H), extend from the cementum (B) into the attached gingiva. Some fibers extend coronally into the crest of the free gingiva, some horizontally, and still other extend horizontally over the crest of the alveolar bone, (C), and then apically to connect on the facial aspect of the buccal plate of the alveolar bone." One of the most important aspects in clinical orthodontics is extrusion and intrusion of teeth. It is often debated that when a tooth is intruded or extruded will the bone follow or not. In the absence of periodontal disease (periodontitis or "gum disease"), the periodontal ligament is not damaged. When a tooth is extruded by forced extrusion of orthodontic means, the alveolar bone will follow. This is due to the fact that the alveolar crest fibers of periodontal ligament are streched, so they pull the alveolar bone. Hence, they stimulate the growth of the elveolar bone in the direction of pulling, which is extrusion. When a tooth is intruded by forced intrusion of orthodontic means, the alveolar bone will follow. The reason is that the oblique fibers of periodontal ligament are streched, so they pull the alveolar bone. Hence, they stimulate the movement of the elveolar bone in the direction of pulling, which is intrusion. It is well known in applied mechanics that a string can only support tension but not compression. And fibers are basically strings. In extrusion, only the alveolar crest fibers are in tension, and the oblique fibers are not in tension. So, only alveolar crest fibers are working whereas oblique fibers are not. Similarly, in intrusion, only the oblique fibers are in tension, and the alveolar crest fibers are not in tension. So, only oblique fibers are working whereas alveolar crest fibers are not. The horizontal fibers are in tension if the tooth is moved bodily in the direction of pulling those fibers. Hence, they are not involved in extrusion or intrusion. In the level-and-align stage of orthodontics, teeth are intruded or extruded accordingly, however small, from the original non-level configuration. Hence, the bony architecture of the periodontium is also changed accordingly. In many cases, especially for adults with compromised dentition (such as with missing teeth), an interdisciplinary treatment is often needed. At presence, dental implants are considered a standard of care for replacing missing teeth, provided closing the spaces by orthodontic means are neither practical nor possible. Some wise dentists have said "A hopeless tooth is not a useless tooth." In certain cases, especially in the esthetic zones (anteriors), a tooth is hopeless accompanied by its bonny defect. One of the obvious treament plans is extracting the tooth and doing bone graft. But bone graft is not always successful and soft-tissue management is often difficult. A better treatment plan would be extruding the hopeless tooth with a purpose of bringing the bone with it. Orthodontist would be a perfect fit for this work. Once normal bony architecture together with good soft tissue are obtained, the hopeless tooth can be extracted and a dental implant is placed to replace the missing tooth. This application of foced eruption obviates the need for bone grafting. Although root resorption is one of the critical problems in orthodontics and some considerable efforts have been spent by various researchers trying to understand the phenomenon, it is still poorly understood. Root resorption occurs with or without orthodontic treatment but more likely with the latter if everything is equal. Common belief or blame for root resorption with orthodontic treatment from dentists who are not orthodontists is that the treating orthodontist tries to move the tooth too fast or with too much force (or moment). But the cause of root resorption is not that simple. In a recent case, the patient had no root resorption before, during, and at the end of about 2 years of a typical/normal orthodontic treatment. But several months after braces are off, the patient experienced moderate root resorption on the upper incisals. Some suggested that the Hawley retainer may be the cause. But the retainer fits well - not creating any jiggling motion. So what could it be? The root of a tooth is typically surrounded by the cancelous bone which in turn is enclosed in the cortical bone. In the cases of fenestration and dehiscence﻿, the cortical bone is resorped. But in other cases, the root is resorped and cortical bone is intact. Although root resorption is a cellular response, it begs the question that for mechanical consideration, which one is harder between dentin and cortical bone? Among the biomaterials, enamel is hardest, and its Mohs scale of hardness is 5. Dentin is softer than enamel but harder than cementum and cancelous bone. Mohs scale of hardness of dentin is 3 and that of bone is 2-3. Cancelous bone is found to be 10-15% softer than cortical bone. So it is not known with 100% certainty which one is harder between dentin and cortical bone.﻿﻿ But some dentists ﻿reported clinically that it is a bit easier to cut the cortical bone than dentin, by using a bur. So cortical bone in the mouth (mandible or maxilla) may be a bit softer than dentin. But long bone is another story. The hardness of cortical bone in longitudinal is different than that of circumferential.